And so the ‘A’ Class European Championships finally got underway with a bang on Tuesday after the first day was cancelled due to excessive wind/wave limits. An earlier start time was planned as the wind was due to increase again and the PRO wanted to get some races under his belt for the 95 strong fleet of both Classics and Foilers. So keen were they to get going that a huge bulge of boats surged forward over the line 10 seconds before the first gun, causing the inevitable General Recall. During this, one unfortunate sailor lost a starboard bow somehow. They got off cleanly second time. In each of the 3 races, it was the left of the course that was favoured. 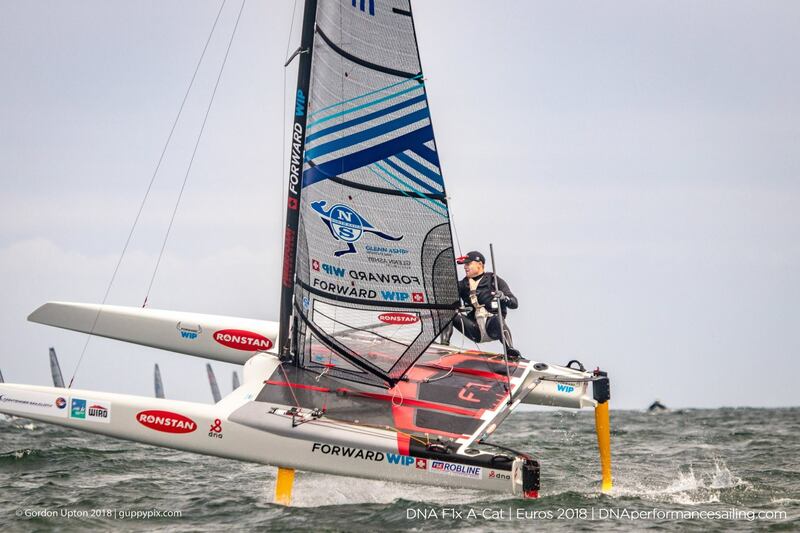 Glenn Ashby, looking for something to play with after his America’s Cup triumph, led from the start, and gave a masterclass in upwind foiling that few, even this DNA team-mate Mischa Heemskerk, could only dream of achieving. It the top mark he led by some 25sec. from Manuel Calavia and Marciej Zarnovski, who led the following pack like hounds following a fox. Next time around he led by over a minute to finish the race a good 2 mins ahead of Manuel in second, Marciej in third and Mischa in forth. Further down the fleet individual battles were fought by sailors who were usually good friends ashore and Ex GBR Olympic sailor Adam May, who on the first lap was 5tharound the top mark, sailed into a hole on a downwind leg but finished a respectable 11th. Also Tom Phipps, in his first ‘A’ Class outing managed a decent 26th, however a catastrophic rudder system failure in the 2ndrace finished his day there. The second race got off cleanly, with young GBR rookie Oscar Lindley-Smith nailing the pin in fine style, as he had been coached to do by Paul Larsen, the afternoon before at half time in the England World Cup game. However, by the end of the first lap, Glenn was in the lead, but chased closer this time by Mischa, Majiej and Manuel with GRE ace Trigonis Konstantinos was following in fifth. By now the wind was increasing and the long fetch meant that the waves started getting larger too. Nothing unmanageable as long as you had the correct mode dialed in, but the conditions started to catch out a few lower down in the pack. Boats would foil off waves and then into the back of the next one, with predictable results. At the bottom of lap 2, the same five had been caught by SWI Champion Sandro Caviezel. At the end, Mischa was following Glenn over the line about 30 secs later, with Sandro then Manuel with Trigonis in 5th. By race 3 things had started to get a little fruity, with larger waves causing many spills as sailors were getting tired. The wind had reached 16-18 kts with 2m waves developing and most had switched on to full survival mode by then. It was thought that maybe over a quarter of the fleet had capsized at some point during the latter part of 2 and race 3. And this was not restricted to the normal people, Trigonis took less care in a gybe and fell over, and Glenn was not immune either, he went over twice, on one he did a classic Moth style capsize when his boat got too high on the foils, flew off a wave and gravity took over. A particularly crowd-pleasing one was Kyle Langford, who stuffed the nose in on the top mark bear-away. The boat went vertical and Kyle smacked into the vertical hull and clung on like a koala to a eucalyptus tree before it fell over. A few unfortunates suffered mast and rigging failures, and a few ran into each other in the bouncy, by now, survival conditions. At the top mark all but the most stupid or extremely confident decided that trapezing was possibly not the way to reach old age. However, sitting in, a few started to foil even in that mode in a sort of devil’s sleigh ride to the bottom mark. At the finish, it was again Glenn, but followed pretty closely by Marciej. Many boats pitched in on the downwind leg, and it is even more galling if it was the final leg and giving away hard won places, but that’s sailing. Tomorrow promises higher winds, so it may be another day on the beach. But many of the racers might be glad of that after today’s events.